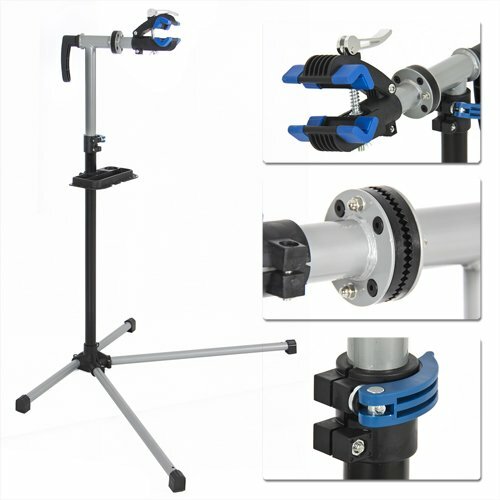 Best Choice Products presents this brand new bicycle repair stand. This repair stand, which can holdup to 66 lbs, is a great comfortable way for dyers to work on their bikes. Its heavy duty clamp protects your bike's finish from scratches while allowing you to work worry free. Features a fastener that can be rotated 360 degree and an adjustable handlebar which holds the front wheel making your work easier. It's lightweight and has a wide base for greater stability. We purchase our products directly from the manufacturer, so you know you're getting the best prices available. New product with factory packaging features: heavy duty construction and durable material quick Release clamp locks bike in place telescoping stand clamp rotates 360 degrees with big gears tool tray w/built-in magnetic compartment adjustable handlebar rod assembles in minutes; instructions, tools and Hardware required specifications: 66lbs maximum capacity clamps fit all standard frames from 1" to 2.5" telescoping stand adjusts height from 41" to 68 1/4" base Width: 40" please note: our digital images are as accurate as possible. However, different monitors may cause colors to vary slightly. Some of our items are handcrafted and/or hand finished. Color can vary and slight imperfections are normal for metal as the hand finishing process as we feel, adds character and authenticity to those items.